Finmax is a relatively new online binary options broker. Launched in 2015, it’s a subsidiary of the Morris Processing Limited. The holding company is registered in the UK with their headquarters located in London. 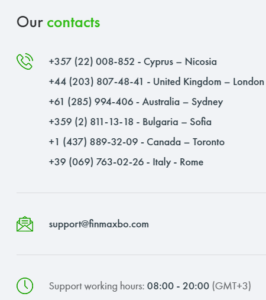 Finmax also has an operational office located in Sofia, Bulgaria. 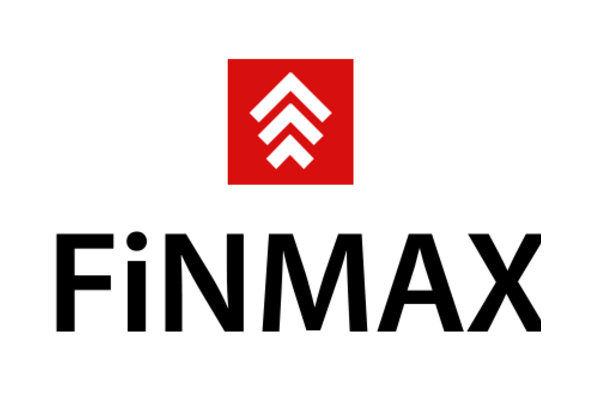 Is Finmax a legit online broker or is it a scam? What makes Finmax stand out? What are the major drawbacks of this platform? Should you open a Finmax trading account? Looking at the main Finmax website, it’s fair to say that they’re a legit business. However, since the websites look alone doesn’t qualify them as legit, we did further investigation to find out if they’re fully licensed and regulated. Currently, Finmax is regulated by the International Financial Market Relations Regulation Center (IFMRRC). This is an independent non-governmental organization whose purpose is to monitor and regulate brokers and dealing centers. Morris Processing Ltd holds the IFMRRC Certificate of Compliance Number TSRF RU 0395 AA Vv0103. The Finmax platform is well designed and easy to navigate. Opening a new account takes a few minutes. You can choose among 4 different account types depending on how much you wish to invest. The account types will be discussed further in this review. Finmax also offers bonuses of up to 100% of the deposited amount. In addition winning trades can earn you up to 90% effective return. Withdrawals are also processed within 48 hours and depending on your account type, you can enjoy free withdrawals. Traders will benefit from the weekly trading webinars published on the platform. In addition, you will gain access to free financial market news published on the platform. Another feature that makes Finmax stand out is the up to 3 risk free trades they offer to new traders. Although we agree that the demo account is one of the main benefits of the Finmax platform, we did find it a bit limiting. You cannot trade CFDs and FX on the demo account. However, Finmax reports that traders will be able to trade these instruments on the demo account sometime soon. Another drawback we found with the platform is their limited selection of tradable instruments. Currently, they offer over 70 assets. This could probably be due to the fact that Finmax is a relatively new player in the market and we can expect them to add new assets as time goes by. 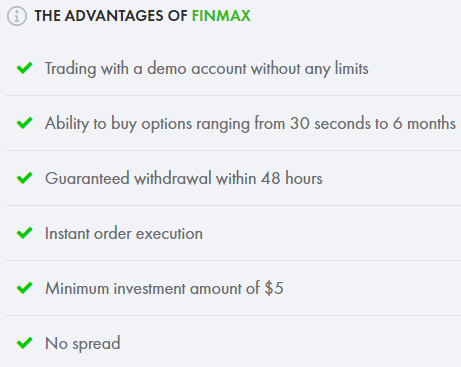 If you simply wish to test the Finmax platform, you can start by opening a free demo account. The Finmax platform is powered by the TradeSmarter software. It’s an easy to use browser based software used by several online trading platforms. Despite being browser based, the TradeSmarter software also allows you to trade using a mobile device. analysis charts which allow you to keep track of specific asset movements. We liked the fact that charts actually fill the entire screen. Finmax also provides advanced charts from TradeView which cater for more advanced traders. The Finmax online broker platform was designed with both amateur and advanced traders in mind. Amateur traders are provided with a rich library of tutorials to get them started fast. For advanced traders, there’s a host of useful features that include daily news updates and weekly webinars among others. One interesting thing about the learning resources is that there’s also a collection of tens trading strategies tutorials. Social trading is fast becoming popular among traders. Finmax has done a good job by providing a social trading feature dubbed “Social Radar”. This feature allows you to keep track of top traders performance. This way, you can learn from them and increase your chances of trading profitably. If you choose to open a Finmax account you will need to choose among 4 different account types. Here’s a brief description of what each account type offers. Opening a bronze account will require a minimum deposit of $250. This account gives you access to over 75 different asset types, an account manager and a free first withdrawal. Your initial deposit can attract a bonus of up to 25%. Opening a silver account requires a minimum deposit of $1000. You can get up to 50% of your deposit as a bonus as well as a risk free trade of up to 25% of your deposited amount. This account type gives you access to a personal account manager and 1 month access to trading signals. Withdrawals on this account type are processed within 48 hours. You can open a gold account with at least $5000 which can attract a bonus of up to 75%. The bonus amount you can receive largely depends on the account type you open. This ranges between 25% for Bronze Accounts to 100% for Platinum VIP accounts. Like with most brokers offering bonuses, you’re required to achieve a specific turnover amount before you’re allowed to withdraw profits. In this case, it’s 40 times the bonus amount received. One thing that separates the Finmax bonus scheme to other online binary options brokers is that bonuses won’t lock in your deposit. That is, you can withdraw your profits even if the bonus turnover hasn’t been reached. The catch however is that you’ll have to forfeit the bonus amount plus any profits earned trading with the bonus. This online options broker offers binary options, CFDs and FX. There are over 75 different financial instruments that include stocks, commodities, indices and currency pairs. For traders wishing to profit from the ultravolatile cryptocurrency market, Finmax offers Bitcoin binary options. Rather than buy or sell the cryptocurrency, the binary options allow you to speculate on its price movements and earn a fixed return. Besides Bitcoin, Finmax also offers Litecoin, Etherum and Ripple. If you’re looking to trade on a more diverse range of cryptos, you might need to open an account with a more established online broker. This online binary options broker offers two trade types the classic High/Low and the Above/Below. With regard to expiry, you can enter and exit a trade in as little as 30 seconds or as long as 6 months. This range of expiries caters for both day traders who want to make profits within a short amount of time as well as traders who wish to hold position longer. Finmax accepts several recognized payment methods. 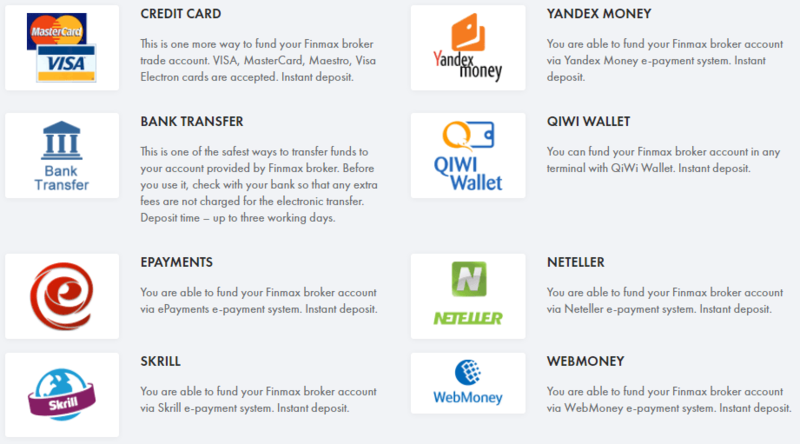 These include bank transfer, credit card, Neteller, Webmoney, Skrill and ePayments. The amount you deposit will depend on your chosen account type. Deposits can take a few hours to several days to reflect on your trader account. You can withdraw funds to any of the accepted payment methods. However, you’ll be required to first verify your account. Withdrawals can take up to 5 days to reflect on your account. However, for silver, gold and platinum accounts, withdrawals can be processed in as little as 48 hours. At the time of writing, there aren’t any IFMRRC warnings regarding this broker or their parent company. After scouring through different binary options trading forums, social media groups and websites, we didn’t come across any trader complaints. Beyond providing a decent options trading platform, Finmax has gone the extra mile to provide unique features all targeted towards helping traders earn more. They include trading news, advanced charts, social trading and analytics. These are available to all account types. For a better overview about this broker, we’ve rated different features individually. Each feature is rated against a total score of 20. The Finmax website is well designed with an intuitive navigation. Traders will find it easy signing up for a demo or real account. At the top of the site are different tabs that will redirect you to different features offered on the platform. Trader friendliness is also seen in the different features such as charts and daily finance news which make it easier to make informed trades. If you like getting bonuses on your investment, Finmax offers you up to 100% bonus on deposits. Depending on your account type, you can also benefit from risk free trades. Withdrawals are fairly straightforward and you can have your withdrawal processed within 24 hours. The site is also easily accessible. It offers support for 8 different international languages. The only major shortcoming we found with the site regards regulation. The IFMRRC regulation means that traders from some countries like the US and Canada aren’t allowed to open accounts with the platform. Finmax offers over 75 different asset types. Compared to more established brokers, this is quite limited. However, we like the fact that they’re offering several cryptocurrencies which are in demand by most traders. This broker offers expiries of between 30 seconds and 6 months. This makes it easier for you to adjust your trading strategy depending on which financial instrument you’re investing in. Like most online brokers, Finmax doesn’t charge a commission on trades. With regard to fees, the platform will deduct a withdrawal fee for Bronze, Silver and Gold accounts. The effective return on successful trades ranges between 70% and 80%. This is a bit low compared to other brokers who offer up to 95% effective return. Since Finmax isn’t regulated by authorities such as CySEC and ASIC, they’re not prohibited from awarding bonuses to new account holders. Opening a new account allows you to get up to 100% bonus. However, in order to be able to withdraw the bonus amount plus profits earned, you must achieve a turnover of 40 times the bonus amount. If however you want to withdraw your funds before achieving the turnover, you’ll need to forfeit the bonus plus profits earned. The minimum you can invest on a trade is $5. This makes it easier to manage your account balance by investing small amounts at a time. job with regard to customer support. Their platform supports several languages. In addition, their customer support team is reachable via email or live chat. They’ve also added a direct call feature where you can leave your number on their site and have a support rep call you back. Finmax accepts several payment methods. Depending on the method you choose, your deposited amount should take anything between a few minutes to several days to reflect on your trader account. The minimum deposit amount is $250 which we found a bit high compared to other established brokers. Withdrawals are processed within 24 hours to 5 days. Depending on your account type, you will be charged a withdrawal fee or not. Besides the free demo account, you are allowed to choose among 2 additional accounts. There’s an additional Platinum VIP account which is available through invitation. The type of account chosen gives you access to different features. Advanced accounts (Gold and Platinum) give you better features and certain privileges which in our opinion are worth the extra amount you’re required to deposit. Since it was established in 2015, Finmax has slowly grown into a reputable online binary options broker. They’ve done a good job creating 4 different account types each targeting a specific type of trader. The platform is well designed and easily accessible via both desktop and mobile devices. So far, there are no complaints about the broker which is a good thing. However, they could use some improvements especially regarding their limited assets offering. Overall, if you were considering opening an account with Finmax, they are worth trying out. This is a bad trading experience. I got scammed by a bogus broker a couple of months ago, it was hard to get a withdrawal after several attempts. I had to hire a recovery solution firm to get my money back. Glad this is finally over for me. I’m quite happy with Finmax trading. Although I have been working with this company relatively recently, I really enjoyed the results. The profit is not bad, and everything is fine with the conclusion. As an investor your major tool for success is information i was a victim of scam due to lack of proper information though that was in past because Finally I have gotten back all my lost fund and bonus from CFD stocks. They stocked all my trading capital and deprived me access into my account for over two months now after I’ve invested $80K with them, my hard earned money. Thought I was not gonna see this day, but as God may have it, today I’ve got back all my money back for real. I will forever remain grateful to God. If you’ve been locked out from logging into your binary option trading account or you are unable to make withdrawal from your broker account, maybe because your broker manager is asking you to make more deposit before you can place a withdrawal and you need my assistance, kindly get in contact with me phic601@gmail.com or via whatsapp +1323612188 and I will guide you on steps to take to regain access to your account, make withdrawal freely and easy, as well as recover all your lost fund.